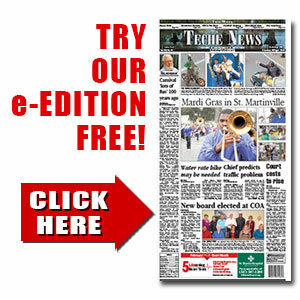 Mardi Gras parade in trouble | TecheToday.com | Teche News | St. Martinville, La. Sometimes it seems like the quickest way to start an argument in St. Martinville is to say the words “Mardi Gras Parade.” It definitely had that effect at the Wednesday, Jan. 13, special meeting of the City Council, and things have only gotten worse since then. The issues that have always been in play regarding the annual Mardi Gras parade sponsored by the Newcomers Club include cost to the city of providing security, safety of the crowd and potential liability to the city, and the effect on Main Street business owners caused by a loss of the day’s business, the clean-up required, and in some cases, property damage. Now, a new report commissioned independently by some city council members and Police Chief Calder Hebert may have fueled the denial of the permit. Attendance numbers for the parade have increased significantly in recent years. A drone video, commissioned last year by the St. Martin Sheriff’s Office, came as a shock to residents who have not seen the scale of it first hand. Attendance estimates range as high as 20,000 for the event, which pretty much shuts the town down for several hours. There is no question that the parade is an event identified mostly with the black community. In terms of population, the black community is the majority one in St. Martinville by a margin approaching 2 to 1. Parade opponents say the cost and risk are too high and that the Newcomers have not done enough to control the event or help the city with the cost. This year the club pledged to pay $10,000 toward security expenses, estimated to reach near $25,000. The sheriff’s office first reversed itself from previous years’ practice of funding 50 percent of the cost of the 90 to 100 officers it provides for the event. The Jan. 13 meeting became very tense when a report authored by Joey Sturm, director of Public Safety and chief of police for the University of Louisiana at Lafayette, was presented by District 1 Councilman Mike Fuselier. In the report Sturm maintains that a minimum of 213 law enforcement officers are needed to adequately police the event. The total last year was 145 according to Chief Hebert, who said that 145 is probably all that can be expected. Mayor Thomas Nelson took exception to the report itself and the fact that it was done without his knowledge, then taken to the sheriff’s office first. He said that there was little reason to go outside local sources about an event which St. Martinville officials have observed and coped with for more than 50 years. Information presented to the Teche News offers evidence that Sturm is clearly a qualified and experienced leader, and his resume does list some credentials in the field of crowd control or event security. Sheriff’s office spokesperson Ginny Higgins cites Sturm’s experience with large events at ULL. In his report, Sturm maintains that, among other things, one officer is needed for every four feet of the parade route to guarantee safety. On Thursday of last week, the sheriff’s office presented a contract with the provision that all conditions of Sturm’s report must be met – an impossibility by design, according to Nelson. Last year was the 53rd year of the parade, and as wild as it looked, no serious incidents or injuries occurred. Parade spectators, however, clearly do not stay behind the barricades along the route and business owners do, in fact, report problems with trespassing and trash. Emergency vehicle access to much of the area is questionable. District 2 Councilman Craig Prosper, apparently feeling that bias on his part was being implied, became quite agitated and left the meeting before the vote was taken. In November when the council first considered whether or not to issue a parade permit, Prosper voted “yes,” but at that time it was assumed that the Sheriff’s office would shoulder the usual 50 percent of costs. Fuselier was the only “no” vote at that time and again at the Jan. 13 meeting, in Prosper’s absence. District 5 council member Romanus “Ike” Robertson, District 3 member Dennis Paul Williams and District 4 representative Debra Landry all voted in favor of the permit. They and other supporters of the parade, including the mayor, said that if the parties had worked together instead of against one another the problems might have been largely solved by now.